Regiment/Catrawd: 6th Battalion The Royal Scots (Lothian Regiment). Service Rank and Number / Rheng gwasanaeth a rhif: Private No. 2717. 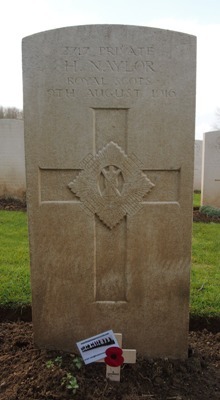 Military Cemetery/Memorial / Fynwent milwrol: Heilly Station, Mericourt-L'Abbe. Ref No Grave or Memorial / Rhif cyfeirnod bedd: Plot: 111. Row: A. Grave: 3. Died of wounds on Wednesday 9 August 1916, aged 21 years. Hugh Naylor was born in Crewe, Cheshire in 1895. The 1911 Census shows that the family lived at 32 Bush Street, Monsall, Manchester, Lancashire, England. The head of the family was Hugh Naylor aged 40, who was employed as a Boiler Stoker. His wife Mary Naylor aged 36 and their three children – Hugh Naylor aged 16, a Clerk, William Naylor aged 15, a Messenger Boy and Harold Naylor aged 7 years. At some stage Hugh lived in Sussex Lane, Rhyl, Flintshire, North Wales. Following the outbreak of the First World War he enlisted at one of the Recruitment Centres in Manchester with 6th Battalion, The Royal Scots. He served on the Western Front in France and died of wounds sustained in action on 9 August 1916. On 21 December 1916, a payment of £3. 12s. 9d. was made by the War Office to Mary Naylor, being monies owed to her son Hugh. On 27 September 1919, a further payment which is recorded as a War Gratuity of £6. 10s. 0d. was also made to her.